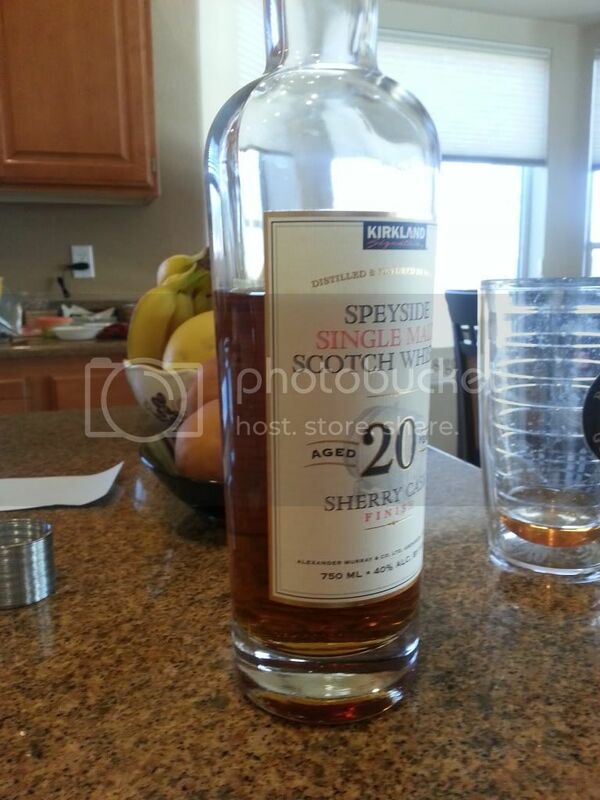 Wow, Kirkland brand 20 yo Scotch?!?! I generally pick up a bottle when we stop in to Costco but I haven't seen this. On another note, Irratebass, no man should have to endure Twilight, your man card is in jeopardy please amend your behavior before you are asked to surrender your card. Been expanding my horizons in the single malts lately. Until recently, I have been drinking pretty much 100% Speyside/Highlands. Went 180* today at a local store that was having a deeeeeeeep sale on everything in the store. Picked up Laphroig Quarter Cask for $38. Very different. Very smokey, but I seem to like that so far. Not quite as 'band-aidy' as the Bruichladdich Peat Project I had at Christmas (and have not found since). I tried this once, and didn't much care for it, I wonder if I should give it one more try. Bought some Dickle because I hadn't had Tennessee whiskey in a while. Doesn't compare to the bourbons I've been having. Think ill be going back; curiosity satisfied. Somebody left a small bottle of Bullock Lade's at the lake house. I wish I knew where they got it, this stuff is fantastic! The cost of living is very expensive yet it remains a popular choice. Had this last night. 'twas pretty good. Just cracked a coors light tall can, I'm going to sip on it while my sr 40oz sits in the freezer. I managed to score a 4-pack of the ultra elusive . . . Heady Topper! One of the best IPA's I've ever had. All I can think of right now is that scene in Spaceballs . . . Lonestar! I am your cousin's, former college roomate's, best friend's former dog's owner's, neighbor. So, what does that make us? ABSOLUTELY NOTHING!! On a serious note, I was in Stowe for the weekend at the beginning of the month. I visited the Alchemist cannery and called 5 liquor stores and could not secure a single can of Heady. Luckily, a co-worker recently went up there to ski and came back with a whole case. 3 fingers of Gentleman Jack, 2 ice cubes. Yum. Heady goes out the same day it comes in at every store I know of that gets it. The cannery generally lasts a bit longer, but not through the weekend. It is crazy how popular that beer is. What is the price tag? Any clue who actually makes it? Ellie's Brown Ale - Avery Brewing Co., Boulder, CO. Great beer!! Old grand dad BIB and Jim Beam Black. I think I like OGD better. WOW! Plead the 5th....great imperial stout! !